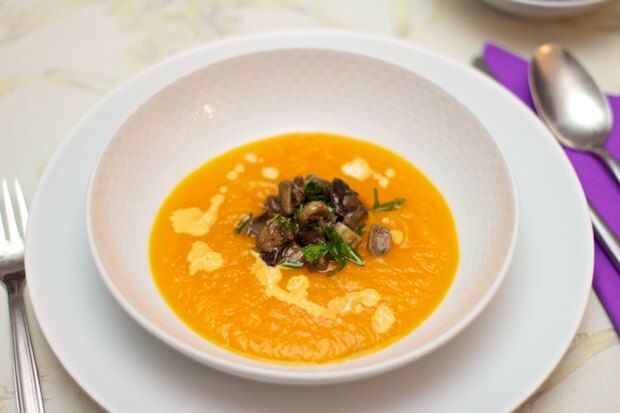 This soup contains the flavors of the month of October: pumpkin and mushrooms. It’s a recipe that is low in calories and perfect for a light dinner or to begin an important meal with several courses. Its beautiful orange color brings happiness. Cut the pumpkin and onion into small pieces. Place the pieces in a deep pot and cover the ingredients with cold water (the water should come flush with the ingredients) salt the mixture lightly then cover with a lid and boil for 30 minutes. While the pumpkin mixture boils, prepare the mushrooms. Add the olive oil, garlic, rosemary, and frozen mushrooms to a pan. At high heat, stir frequently to cook the mushrooms (about 10-15 minutes). Season with salt and pepper, then remove the rosemary and garlic. When the pumpkin is cooked, add the granulated vegetable stock and reduce to a purée with an immersion blender. Place in individual soup bowls and at the center of each serving, add a spoonful of mushrooms and a tablespoon of cream. Serve immediately. Posted in Soups and tagged with Cream of Pumpkin Soup with Mushrooms, Crema di Zucca con Funghi. RSS 2.0 feed.